When I retired from a career as an insurance executive six years ago, I was surprised at the range of thoughts and emotions I had. Even though I had planned for retirement for many years, I didn’t expect the self-reflection that would come. One day I stopped going in to the office, but I was still “programmed” to go somewhere. But just where that was wasn’t clear. Yesterday I was shaping the sides of an acoustic guitar I am making. For this particular guitar I am using very curly Hawaiian Koa wood for the back and sides. After taking the thickness down to the point that it sounds like distant thunder when I shake them, or about 0.085 inches, I bend them in the shape of the guitar using a mist of water and heat, which creates steam and makes the wood willing to change shape when carefully pressed in a mold. It’s a risky process because Koa tends to crack unless you gently work with it and not force it. Like the bending of the beautiful and delicate Koa wood, God’s gentle hands were pressing against his creation—me—as I somewhat painfully changed shape in a new chapter of life. A new chapter of life brings new ways to serve God. I committed to following Jesus as a child, and he has never let me wander too far from him, in spite of my own weakness to temptation or distraction. While still stumbling on occasion, his Spirit has put the desire to love others and do his work in my otherwise selfish heart. So whatever my new retirement gig was to be, I knew in some way it needed to serve him. I need to disclose a little more to you to explain how I came to become a guitar builder. Before my insurance career, I was a professional musician and have played and studied the guitar throughout my life. I have also been fortunate to become friends with a world-renowned luthier who builds guitars for some of the best musicians in the world. I’m fortunate to have more than one of his guitars. I also love working with my hands. Before retiring, I had built a guitar kit and surprised myself with the result. And I just love wood. I love the beauty, texture, and the musical tones that come from woods. I see them as God’s handiwork. Building a beautiful guitar involves working with beautiful wood material. A nexus formed in these loves; and while waiting for God’s direction for my new chapter, I found myself buying wood, designing guitar specifications with the help of my friend, and accumulating a few more tools. Before long, sawdust began to fly. 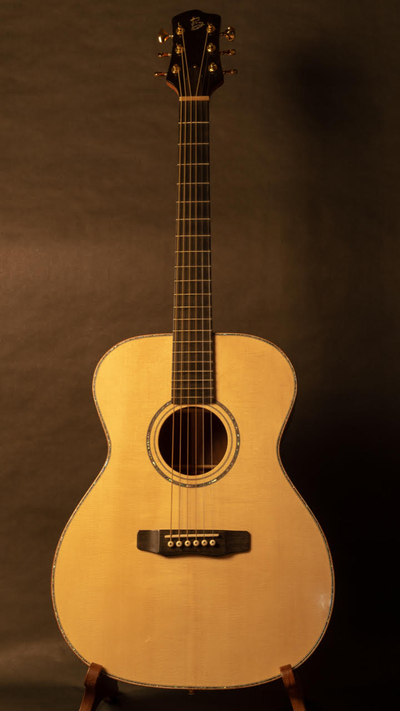 For this particular guitar I am using a top made of Alpine Spruce. I have a supplier in Germany who cut this particular tree in the Italian Dolomite Alps (South Tirol), 1600 meters above sea level in the winter of 2014/15. Hawaii and the Italian Alps are on opposite sides of the planet, and yet their wood makes a perfect pairing in this instrument. I have lots of work ahead. I need to carefully thin the spruce down to about 0.115 inches thick and join two “book matched” plates together to make the top. I will inlay a rosette around the sound hole of paua abalone shell from waters off New Zealand. Just like people need a support system in their lives to survive the many tensions they face, guitars also need strong structural support. One of the countless steps I enjoy the most is carving the braces, the structural supporting pieces inside the guitar that keep it from collapsing under the string tension while still allowing the top to vibrate and release the tone of the wood and music of the guitar player. I make the braces individually out of red spruce from the Adirondack Mountains. Red—or Adirondack—spruce has the highest strength-to-weight ratio of all woods on earth, which is perfect for adding support for the top without dampening the tone. It’s the same wood Howard Hughes used when he built the Spruce Goose! There is both science and art involved in carving braces. 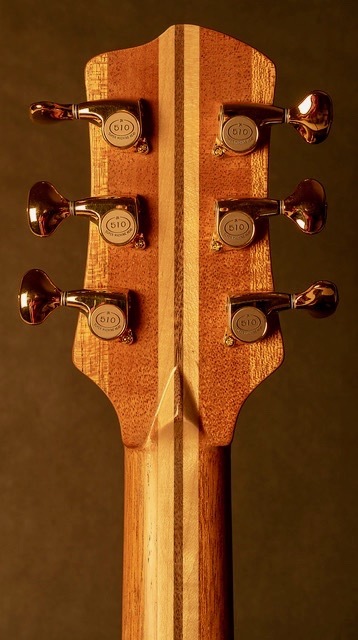 They are shaped like the Golden Gate Bridge in that they span across the guitar top, are narrow, and have towers, or nodes, to add structural support. 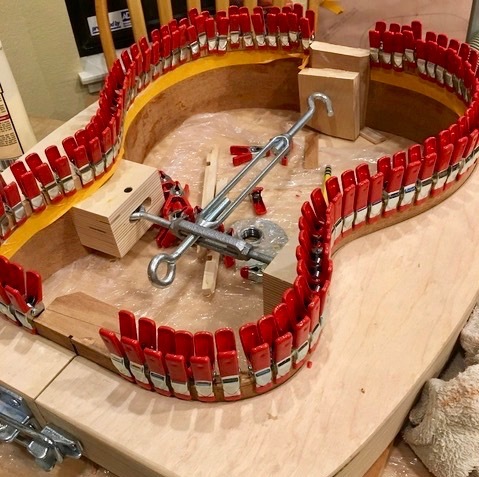 The trick is to take away as much wood as possible, leaving just enough to support the top, and to place the nodes in the exact spots where the top will vibrate the least when the guitar is being played. I do all this work with very sharp chisels, slowly and carefully. Like a guitar builder, God is revealing the work of his hands in his children. In fact, it has been said that great guitar builders start with wood and carve away everything that is not a guitar. I like that perspective because I believe that God has hidden away great instruments inside of trees for some of us to carefully carve out. It also reminds me of his process of revealing himself in his children. He puts eternity in our hearts, and slowly everything that is not of God is shed away. As I write this I am currently building five guitars. The Koa/Alpine Spruce guitar is bound for a Christian man who recently experienced the tragedy of losing both his son and his wife. Two others are bound for worship leaders in different churches. I think of each of these people as I handle the wood, sand, carve, bend and glue. I think of how they will use the guitars in the years to come. I hope that the work of my hands can help bring joy where there are tears, praise from those who seek to worship, faith to those who seek to find, and even laughter and delight. The book of Revelation tells us that there are harps (perhaps some of these are like guitars) in heaven used to worship God. It’s no wonder that he has hidden them is trees across earth for us to discover and use for his purposes here. Inside of each guitar I build, I include a reference to Psalm 90:17. It reminds me that even in my post-career phase of life, a simple thing like building guitars can be used by God in ways beyond what I can see now. I rarely think of the office anymore, because I have found my purpose for today. George and his wife of 40 years, Jane, live in Northern California. When he is not building guitars or making music, he is playing with his grandchildren, swimming open-water competitions, surfing, or bird-watching in the local hills. To find out more about George’s guitars and music, check out bowenguitars.com.